How many ways can you increase your donated dollar? 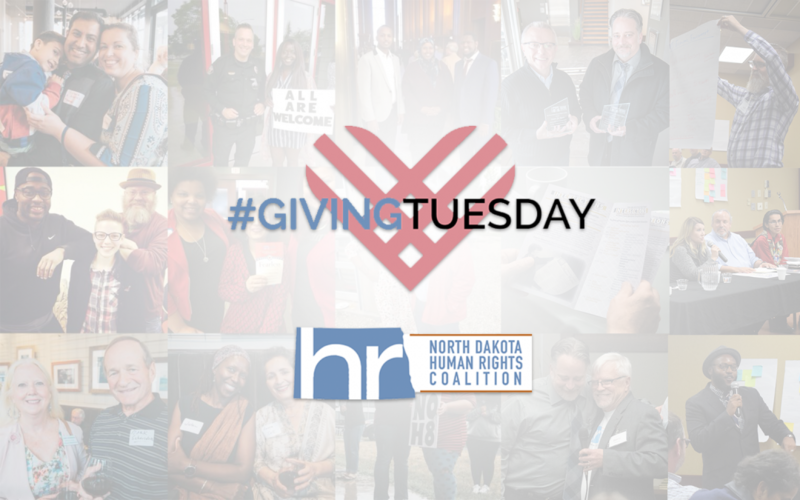 On #GivingTuesday your donated dollar to North Dakota Human Rights Coalition can be increased not once, not twice, but three times. A challenge match grant from Equality Federation doubles the value of your donation if given by December 31, 2018. A challenge from an anonymous donor will match your donation on #GivingTuesday – up to $5,000! Facebook is partnering with Paypal to match donations up to $7 million to U.S. nonprofits on Facebook. As a supporter of The North Dakota Human Rights Coalition, we need your help to positively impact human rights in North Dakota. Your donated dollar brings the communities of North Dakota together, allows the NDHRC to advocate with and for residents still fighting to achieve basic rights in employment and housing, educates as to how human rights affects us all, and enables the NDHRC to support people when they feel threatened. Invest in human rights on #GivingTuesday. Invest in human rights on #GivingTuesday. Donate via our secure online portal, or on Facebook. Be the change North Dakota needs and support human rights for all people in North Dakota.